The small but intrepid team at Harmonic Subtones have brought us a fitting encore to their acclaimed Emotional Cello — the new Emotional Violin. Deeply sampled and highly musical, this solo violin virtual instrument will easily compete with and even surpass products emerging from much larger competitors. 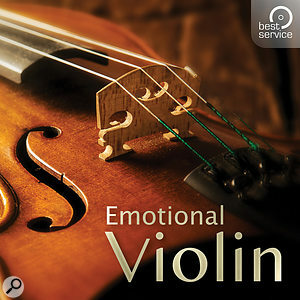 Despite being stuffed full with options, Emotional Violin opens to a compact and friendly interface, with most relevant items immediately within reach. Working in the Master Instrument, on the left are 25 keyswitchable techniques and articulations which can be unloaded to lessen the memory load of the already substantial 1.5GB instrument. On the right are Momentary Keywitches, or MKS, placed immediately above and below the playable range, allowing for mid-note modulations of selected left-side articulations. The combination of articulations and MKS is where the magic of the instrument really happens. For instance, while playing the 'Delicate Vib' articulation, we can trigger C#6 to end the note on a longer crescendo, D6 to end it on a shorter crescendo, or D#6 or E6 to end with a tasteful diminuendo. There are a number of wonderful options here, altogether leading to the ability to craft realism and musicality. Dynamics are mapped to the mod wheel, while many of the articulations allow for beautiful rising or falling portamento when played with a gentler velocity. Bow change legato and finger legato are similarly triggered via velocity, with the velocity range for all three tweakable via two sliders at the bottom of the interface. In exploring the instrument one discovers that certain portamento patterns between major and minor seconds are deliciously drawn out and characterful; this certainly adds to the expressiveness of the instrument. Con sordino is also an option, and can be toggled on and off in the effects section. The instrument itself sounds warm and immediately present. It is dry while retaining richness, and transfers well into various IR reverbs despite having a bit of a natural release tail; additional IR reverb and room options are available on board. The instrument is organised into three folders: Masterpatches, Individuals, and Specials. The Masterpatches folder allows one to pick between a rich and highly expressive instrument and an instrument with a softer dynamic and less vibrato. As both instruments adjust legato automatically to playing speed, a manual legato patch is also available for further customisability. Other folders provide access to smaller individual techniques, not all of which are included in the master patches. The Sul G flautando is a much appreciated harmonically rich inclusion here. Certain rare virtual instruments are able to inspire music in and of themselves, while even rarer is the instrument which responds to a composer's wishes instead of painting the artist into a limited digital corner. Emotional Violin both inspires and gives compositional freedom, and therefore comes highly recommended. As for the many fans that this new instrument will surely inspire, Harmonic Subtones are now promising us a sequel which truly can fill a surprisingly under-served part of the industry: a deep sampled viola.